Flor, Alexander G., Melinda dP. Bandalaria, Margaret J. Suarez, Ethel O. Sibal and Emely M. Amoloza. 2011. The Changing Profile of Distance Learners. PSDL Journal. Diliman, Quezon City. Maclean, Scott, Alexander G. Flor and Malcolm Hazelman, 2009. ODL for Agricultural Development and Rural Poverty Reduction: A Comparative Analysis of Best practice and Innovation in Asia. ASEAN Journal of Open and Distance Learning. Volume 1, Number 1. Flor, Alexander G. 2009. eAgriculture’s Response to an Emerging Global Food Crisis. I4D: Information for Development. (New Delhi). Flor, Alexander G. 2008. A Policy and Planning Framework on Information and Communication Technology for Basic Education in the Philippines. International Journal of Education and Development. Volume 4 Number 3. Flor, Alexander G. 2001. Incorporating Environmental Themes in an Existing Curriculum: A Case Study of the Nonformal Educational Subsector. The Journal of Environmental Science and Management Vol 4 No1. UPLB-School of Environmental Science & Management (Los Baños). Flor, Alexander G. 2000. Strategic Communication Analysis of Entities Affected by the Kanan B-1 Hydroelectric Dam. The Journal of Environmental Science and Management, Vol 3, No.1. UPLB-School of Environmental Science and Management (Los Baños). Flor, Alexander G. and Felix Librero. 1999. Perceptions of Common Property in Ecosystems Under Stress: The Case of the Mt. Apo Geothermal Plant. The Journal of Environmental Science and Management, Volume 2, Number 1, UPLB-School of Environmental Science and Management (Los Baños). Flor, Alexander. 1997. Transformational Communication: A Normative Approach to Environmental Education.Tambuli. A Journal for Coastal Management Practitioners, November 1997, USAID Coastal Resource Management Project (Cebu City). Flor, Alexander G. 1993. The Informatization of Agriculture. The Asian Journal of Communication, Volume II, Number 4. AMIC (Singapore). Flor, Alexander G. 1993. Upstream and Downstream Approaches in Development Communication. IDC Faculty Papers. UPLB Institute of Development Communication (Los Baños). Flor, Alexander G. 1993. The Fifth Theory of the Press. The Los Baños Journal, Volume III, Number 3. UPLB (Los Baños). Flor, Alexander G. 1991. Development Communication and the Policy Sciences. Journal of Development Communication, Dec 1991. Asian Institute of Development Communication (Kuala Lumpur). Flor, Alexander G. 1988. The Information Wastage Ratio: Towards a Theory of Rates of Information Generation and Utilization. Scientometrics Vol.13, Numbers 1 and 2. Elsevier Scientific Publishers (Amsterdam-Oxford – New York) and Akademiai Kiado (Budapest). Flor, Alexander G. 1987. Alternative Visions Versus Realities in Communication Education. Media Asia. An Asian Mass Communication Quarterly. Volume 14, Number 1. Asian Mass Communication Research and Information Center (AMIC, Singapore). Flor, Alexander G. 1987. The Information Rich and the Information Poor: Two Faces of the Information Age in Developing Country. SEARCA Diary. Volume 16, Number 3. SEAMEO Regional Center for Graduate Study and Research in Agriculture (Los Baños). Flor, Alexander G. 1986. Some Notes on Participatory Educational Broadcasting: The Los Baños Experience. The Third Channel: Journal of the International Broadcasting Society. Volume 2, Number 2. International Broadcasting Society (Seoul). Flor, Alexander G. 1986. Perceived Offensiveness in Advertisements. DEVCOM Quarterly. Volume 4, Numbers 1 and 2. Institute of Development Communication (Los Baños). Flor, Alexander G. 1985. The Corner Office as a Status Symbol in the Academe: A Study in Proxemics. DEVCOM Quarterly. Volume 3, Number 2. Institute of Development Communication (Los Baños). Flor, Alexander G. 1984. Towards the Development of a Coefficient of Communication Convergence (A Quantitative Measure for the Policy Delphi). DEVCOM Quarterly. Volume 2, Number 4. Institute of Development Communication (Los Baños). Flor, Alexander G. 1984. Participatory Filmmaking: A Structural Analysis of Cinema Direct. DEVCOM Quarterly. Volume 2, Number 2. Institute of Development Communication (Los Baños). Flor, Alexander G. 1984. The Proactive Information Society: A Scenario. DEVCOM Quarterly. Volume 2, Number 1. Institute of Development Communication (Los Baños). Flor, Alexander G. 1983. The Need for National Communication Policies: The Case of DOMSAT. DEVCOM Quarterly. Volume 1, Number 4. Institute of Development Communication (Los Baños). Flor, Alexander G. 1983. Problem Structure and Cost Analyses of a Rural Educational Radio Station. SEARCA Diary. Volume 12, Number 9. SEAMEO Regional Center for Graduate Study and Research in Agriculture (Los Baños). This book presents a framework on the digital divide dichotomy using critical theory. It is required reading for undergraduate students under the Bachelor of Science in Multimedia Studies program as well as graduate students under the Master of Development Communication and Doctor of Communication programs. A book exploring the depth and breadth of the development communication discipline while attempting to redefine the boundaries and reconstruct the narrative that forms the basis of its praxis or “the process by which theory is or applied.” This is particularly significant to the study of development communication, wherein theory and practice are expected to validate one another. Textbook for ENRM 222, Environmental Advocacy, under the Environment and Natural Resources Management Program of UPOU. It is comprehensive constituting eleven chapters and an extensive appendix that includes an environmental IEC guidebook as well as sample communication materials. An introductory textbook on development communication for graduate and undergraduate students. It is being used not only as required text for the U.P. Open University and other colleges and universities in the Philippines but also in universities in Thailand and Indonesia. A volume on open learning and distance education in three Asian countries – Indonesia, Sri Lanka and China – covering basic, higher and nonformal education modes. It focuses on issues beyond access and equity, i.e., social acceptability, appropriate technology, and the policy environment. A manual on using video technology to document, store and retrieve indigenous knowledge co-published by. This is the third volume in SEAMEO SEARCA’s Knowledge Management Trilogy. Flor, Alexander G. 2002. Communication and Culture, Conflict and Cohesion. Los Baños: UPLB CDC and the Foundation for Development and Communication. A book of readings on conflict in four countries: Zimbabwe, the Aceh province of Indonesia, Malaysia, and Mindanao island in the Philippines. It explores the cultural dimensions of conflict and offers a communicational dimension for post conflict management. Flor, Alexander G. 2001. eDevelopment and Knowledge Management: ICT Applications for Sustainable Development. Los Baños: SEAMEO SEARCA. Trailblazing publication on the development applications of knowledge management used as a textbook for knowledge management courses offered at the University of the Philippines Los Baños. This is the first volume in SEARCA’s Knowledge Management Trilogy. Flor, Alexander G. 1995. Broadcast-Based Distance Learning Systems. Diliman, Quezon City: University of the Philippines Press. Textbook on distance learning and participatory educational broadcasting management written under the sponsorship of the University of the Philippines Textbook Writing Program. 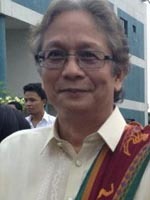 The book’s foreword was written by University of the Philippines President Emil Q. Javier. Flor, Alexander G. and Ely D. Gomez. 1993. Environmental Communication: Considerations in Curriculum and Delivery Systems Development. Los Baños: UPLB Institute of Development Communication and the USAID Natural Resources Management Project. This book focused on curriculum and delivery systems development for environmental communication education with an extensive literature review on the field’s current paradigm shift. Its preface was written by DENR Undersecretary Ben Malayang III. Flor, Alexander G. 1993. Cultural Dimensions of Environmental Information, Education and Communication. Nova Scotia, Canada: UPLB SESAM and Dalhousie University. This volume’s main thesis is that environmental education can only be effectively implemented through cultural interventions or enculturation. Flor, Alexander G., Heinze Kroske, Sylvia H. Guerrero and Marlito Cardenas. 1993. Public Participation in EIA: A Manual on Communication. Manila: Asian Development Bank and the DENR-Environmental Management Bureau. Flor, Alexander G., Marlito Cardenas, Rudolf Reuther, and Sylvia H. Guerrero. 1993. Public Participation in EIA: An Environmental Monitoring Manual. Manila: Asian Development Bank and the DENR-Environmental Management Bureau. Volume II of Public Participation in EIA gives the rationale and procedures of multi-partite monitoring. Flor, Alexander G. and Benjamina G. Flor. 1992. The ATEP Instructional Materials Development Guidebook. Pasig City: ADB Agricultural Technology Education Project and the Educational Development Projects Implementing Task Force. This guidebook was written for Diploma in Agricultural Technology instructors. It gives step-by-step instruction on how to prepare low cost educational materials appropriate to DAT students. Revised manual on audiocraft published by the Technology and Livelihood Resource Center. Flor, Alexander G. and Narong Sompong. 2011. An Online Conversation Among Southeast Asian Higher Educational Institutions and its Observed Oppressions. Meta Communication for Reflective Online Conversations: Models for Distance Education. (Ugur Demiray, Gulsun Kurubacak and T. Volkan Yuzer, Eds). Hershey, Pennsylvania: IGI Global Academic Publishers. Flor, Alexander G. and Thanousone Phonamat. 2010. Status and Prospects of the ICT Service Industry in Lao PDR: Implications to Higher Education. Higher Education and Industry Clusters (J. Mongkhonvanit, Ed.) Siam Academic Publishers and Ex Libris Press. Flor, Alexander G. 2004. Social Capital and Network Effect: Implications of China’s elearning and Rural ICT Initiatives. Building e-Community Centres for Rural Development: Report of the Regional Workshop. Indonesia: United Nations Economic and Social Commission for Asia and the Pacific and ADB Institute. Flor, Alexander G. 2003. Philippine News Media and the New Media. News Media and the New Media (Madan Mohan Rao, Editor). Singapore: Eastern Universities Press. Flor, Alexander G. 2003. Environmental Communication, Strengthening Women’s Voices (Mildred O. Moscoso, Editor) Singapore: Eastern Universities Press. Flor, Alexander G. 2002. Incorporating Environmental Themes in Nonformal Education: Integration or infusion?. Searching for New Models of Agriculture Education in a Disturbed Environment (Samuel T. Mancebo, Marylin B. Perlas, and Frances Muriel L. Tuquero, Editors.). Bangkok: Food and Agriculture Organization of the United nations Regional Office for Asia and the Pacific. Flor, Alexander G. 2002. Knowledge Management: An Emerging Model for Agriculture and Environment Education Development.. Searching for New Models of Agriculture Education in a Disturbed Environment (Samuel T. Mancebo, Marylin B. Perlas, and Frances Muriel L. Tuquero, Editors.). Bangkok: Food and Agriculture Organization of the United nations Regional Office for Asia and the Pacific. Flor, Alexander G. 1998. The Philippine Communication Scene. The 1998 Asian Communication Handbook (Duncan Holiday and Anura Goonasekara, Editors). Singapore: Asian Media Information and Communication Center.